Hope you’re having a great week! 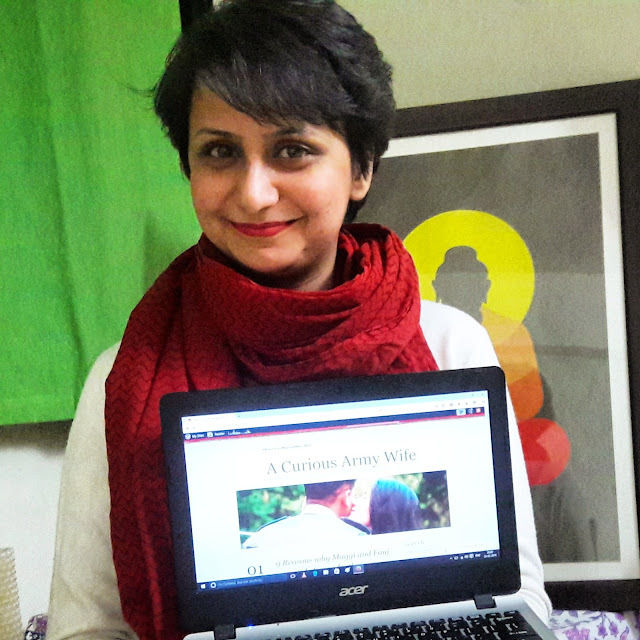 I am SO excited to announce the start of a new series on the blog – ‘Wife in the Army’ where I’d be interviewing some of the coolest Army wives around to get to know their experiences, their quirks, their woes and moments of craziness in this awesome organization and I hope they help you, esp. the girlfriends and new wives to learn more about this life! I’m glad to start the series with Anamika Nandedkar who writes the hilariously honest blog A Curious Army Wife, which is one of my top favourites and which I religiously read every single word of, before marriage. You must too! How did Army happen to you? A common friend introduced us in school, years later, we met again as he was looking for a partner for the NDA Ball. We met a couple of years later and fell in love. Yeah, I know we are super slow. After three years of courtship and thousands of blackmailing attempts from our parents, we got married. And that's when Army happened. What was your welcome prank? Describe Anamika before and after Army happened to her. I have changed many cities owing to my career in journalism before marriage. I would dream of having a settled life, at least in one city, after I got married. But Major Sa'ab's entry in my life meant I could kiss that thought goodbye. Life in Army taught me to be ready for postings, shiftings, bitching, learning, and bad news. How did marrying into the Army impact your career? Oops! Dukhati rag pe haath! I left my job in a leading newspaper to move to the town where my husband was posted. Within 3 months, we got posted to an even smaller town, where chances of me getting a decent job were nil. It did pinch me that my career graph dipped drastically, but after some months, I found other ways to earn. I discovered the new world of online content writing and blogging — that's how the blog A Curious Army Wife was born. I joined Tupperware to connect with women outside the cantonment, and pestered my friends into buying stuff, haha. And when my husband's field posting came, I went back to a big city to start working again, making up for lost time. In short, I had to accept that I will have to compromise heavily when it came to my career, and I was fine by that. What do you love most about being an Army wife? Life in Army gave me a chance to see firsthand how the men and women in olive greens live and function. It has taken me to places I never imagined I would go, and meet people from all regions of the country. What do you dislike about being an Army wife? One, that I am the second most important thing in my man's life. Two, the constant anxiety that comes with the role of being married to a man who likes to play with guns. How do you deal with periods of separation? I am dealing with it right now, and working is the best way to keep yourself busy. I have realised that having too much time on hands makes one go paranoid in a long distance relationship. Have you ever had to deal with difficult senior ladies? How did yo tackle it? I've had my share (maybe less than others') of tussles with senior officers' wives, stories that now make me chuckle. It's hard for ladies in the Army to get along freely if the 'protocol' sword is dangling on our heads all the time. Whenever I was genuinely at fault, I learned my lesson. Other times, I learned a lesson about whom not to be like in life. Your words of wisdom to survive the AWWA/Ladies Meets? I don't have any experience of AWWA meets (how lucky am I). As far as Ladies' Meets are concerned, go if you like it and don't go if you hate it. It should be as simple as that. There is no such thing as “have fun compulsorily”. Which has been your favourite station yet and why? Do you love wearing sarees (considering we have to wear one too many)? What are your favourite ones? 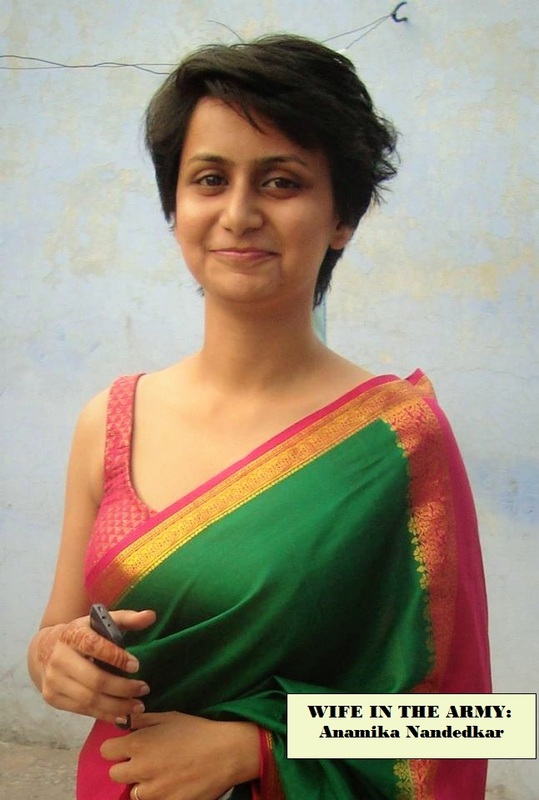 I absolutely love wearing sarees and had a sizable collection even before marriage. Even though we crib about it, it is one special power we have that not many friends in civil can boast of – wearing a saree flawlessly and carrying it off in style. Kanjeevarams are my all-time favourites. What is the ONE style rule an Army wife should never forget? An army wife's winter wardrobe should be complete — from trendy coats, woolen blouses, sweats, scarves, socks, thermals, caps and mittens — more out of the need for surviving the chilling winter parties than anything else. How different do you think your life would be if you were married to a civilian? I am a civilian, so my life would not have been different than what it was previously. It is different because my husband is in the Army. As long it is the same man, civil or Army doesn't matter to me (that's my age talking, urghh). On second thoughts, maybe I would have been earning a lot more had I stayed in the civil world and inhaled a lot more toxins in the big bad cities. What’s your advice to the girlfriends and new wives on surviving life as an Army Wife? Thank you so much Anamika! For more of her wisdom and humour, please visit her blog!